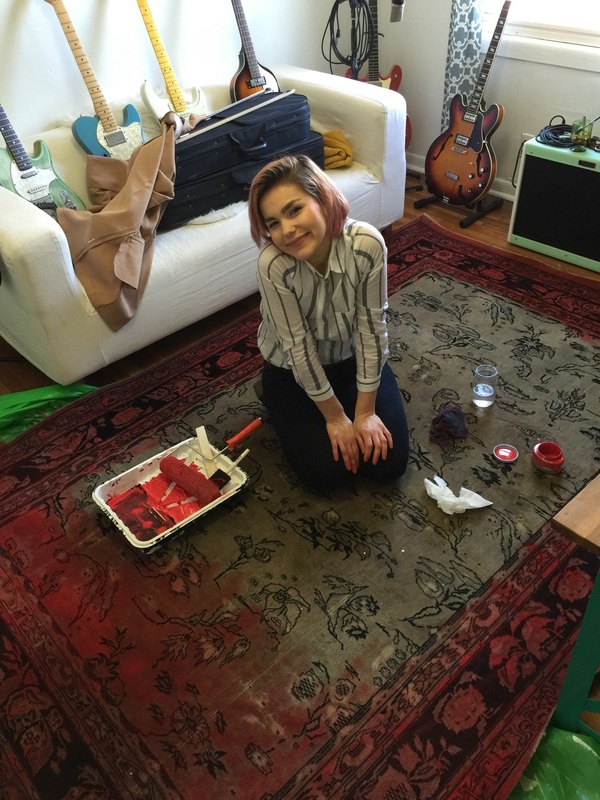 Due to popular demand, I've decided to do a mini-DIY on how I painted my rugs yesterday! Don't get me wrong, I love doing things myself. I love doing all the things (as any Scorpio does), but I don't usually plan ahead for a post about it. Thus, I end up answering all questions and step-by-step instructions in my Instagram comments. For this particular project, it was basically a silly blip of an idea that began growing a few nights ago as I meandered through various websites for rugs to put around our home. I realized I hated that I already had closets filled with rolled-up rugs that just didn't suit our style anymore, and i hated the idea of buying more rugs just to suffer the same fate eventually. Pinterest saved me! After doing my fair share of pinning my dream rugs to my "Our Guest Room" and "Studio" pin-boards, I thought to search painted rug DIY. Boom! Hundreds of other people had thought of, and done this exact thing with fair to amazing results. I figured I'd give it a go. In our situation, we already loved the patterns of our rugs, just not the color. These rugs didn't have a very bright future if this project didn't turn out, so I was willing to sacrifice their existence for this possible outcome. If you don't have rugs that are already on their deathbed, then I would further search Pinterest for your own custom project concept. FOR THOSE OF YOU WHO HAVE RUGS ON THEIR DEATH BEDS, READ ON. Our rug was an antique and very very low-pile. I attempted rolling but it didn't rub into the carpet like I wanted it to. Feel free to try it. If you think you'll need a tarp, lay it out on a flat surface, then unroll/unfold your rug onto the tarp. Prep your station with your supplies and be ready to squat/kneel for the duration of project. We have hardwood floors, so I have a few bruises. 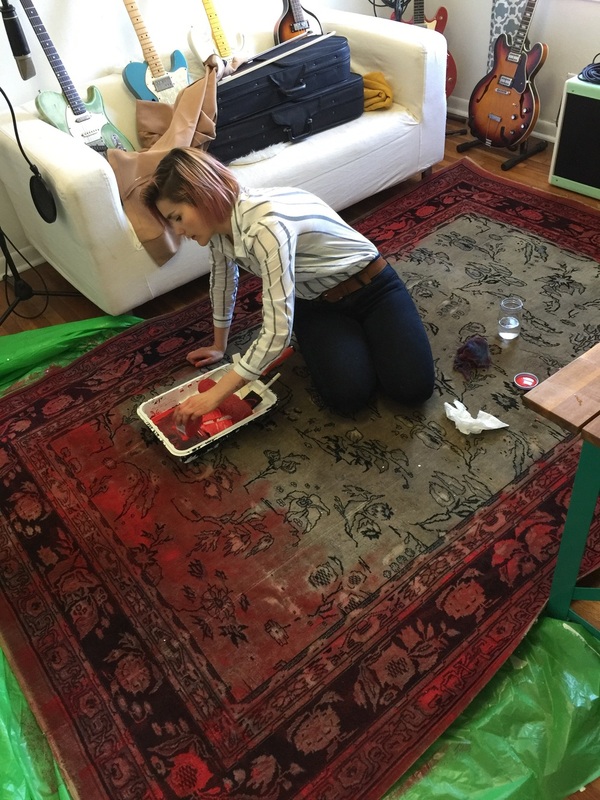 Start staining your rug! I actually used three paints, pink, purple, and gold glitter for my purple rug, alternating corners and stripes, making kind of a stained-glass over-dyed look. Allow to dry or cure for a few hours, or until fully dry. Optional: Seal your rug with some heavy-duty *animal friendly* sealer. I haven't done this yet, but I'm planning on it. Please Pin these images to your Pinterest pin-boards! We are just starting up on Pinterest and would love to keep sharing what inspires us!